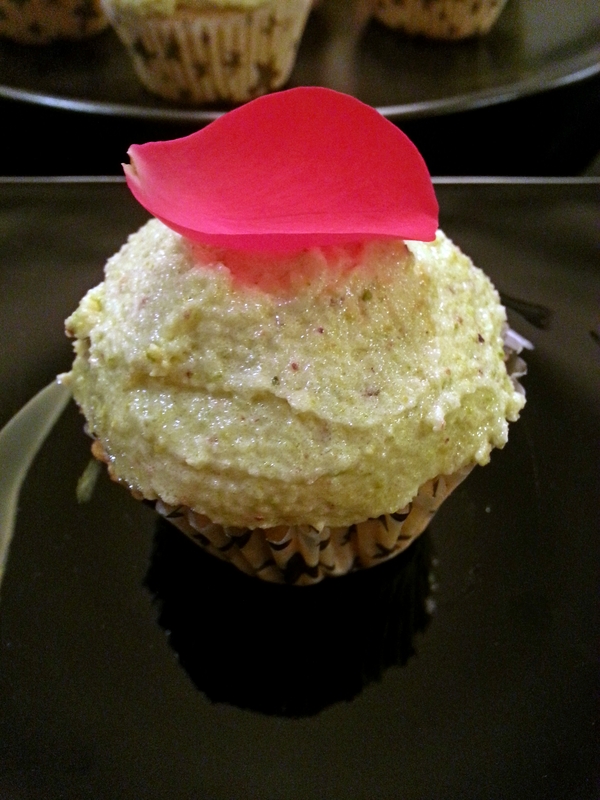 My mother loves pistachios in all forms, as she was spending her day with us I thought I should make her some cupcakes. 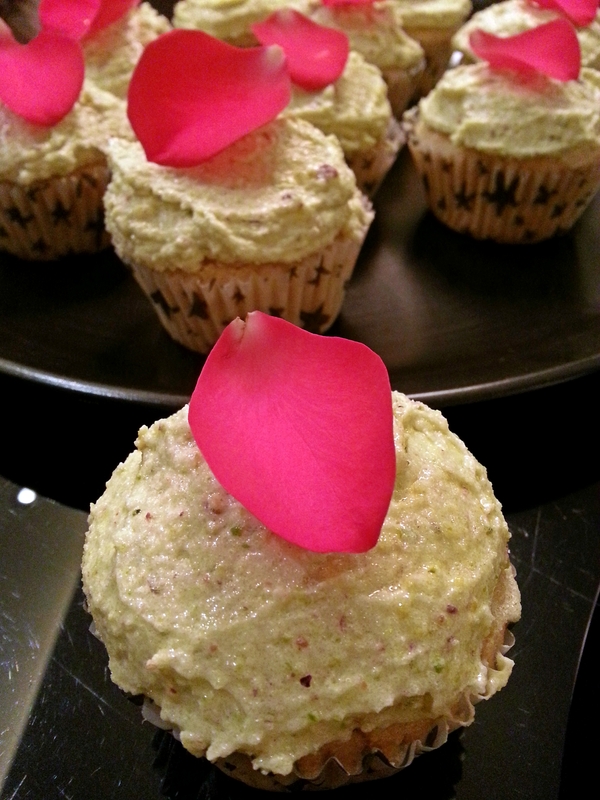 I remember last year I had baked her egg-free pistachio cake and she had loved it, though this recipe is not egg-free it does have pistachio and rose water butter cream icing which she absolutely loves. 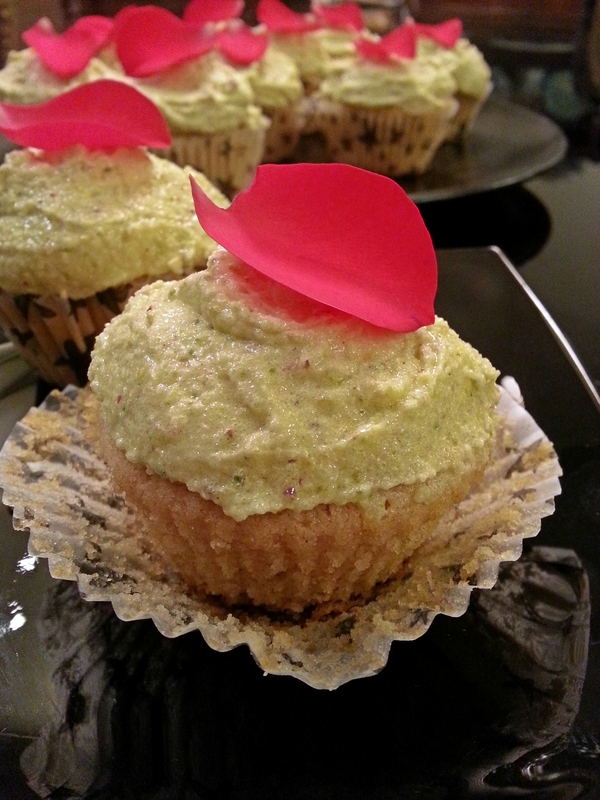 The rose water makes a fantastic addition to the cupcakes, its fragrant but not too intense and you don’t need to put too much to get that lovely effect. Pistachios compliment the flavour really well and the soft green colour of the nuts looks gorgeous. I really wanted to use crystallised pink rose petals but my younger daughter wanted to decorate these and her choice was red rose petals so thats why red and not crystallised. Well my mom loved them and was extremely happy with her grand daughters icing and decorating skills so it was a win-win situation for me. Preheat the oven to 180 degree centigrade, and line the muffin tray with paper cases. In a large bowl cream the butter until soft add the sugar and beat with an electric hand mixer until the mixture is light and fluffy. In another small bowl whisk the eggs together with the rose water for a few seconds, then gradually add this to the creamed butter mixture, beating all the time, next beat in the buttermilk and then sift in the flour and fold in gently to combine. Divide the mixture between the muffin cases, filling each one of them three-quarters full, bake for 20-25 minutes or until golden on top and a toothpick inserted into the centre comes out clean. Allow cupcakes to cool in muffin tin several minutes then transfer to a wire rack to cool completely. Meanwhile make the icing.Place the pistachios in a food processor and whiz for a good few minutes to form a fine powder, then add the icing sugar and pulse to mix. In a large mixing bowl cream the butter until soft add the pistachio and sugar mixture a little at a time until combined, then add the rose water and continue to beat until the mixture is light and fluffy. Spread the icing on the completely cool cupcakes using the back of a teaspoon or a palette knife. Transfer to a serving platter and scatter with rose petals.